This was another one of those books that I stumbled across and decided to read. It was a new author to me, and I'm always interested in new voices. Sometimes it works well, other times not-so-much. This was one of those times I was excited to have found someone I'll surely read again. Here's the blurb, and we'll chat on the other side. The wit and banter in this book had me sucked straight into these characters. Michelle wrote a great hero and heroine with plenty of sparks. The story kept me guessing as to what exactly was going on, which I always like. And while I like heroes being, well, heroes, there were a few too many moments of Nicholas having to save Emily. That being said, they both were solid leads, and Emily was never a weak woman. She was a strong pairing for Nicholas, and he was a well-written lead. Strong when needed and still tender in just the right moments. I truly loved his heart for everyone around him, and his pure faith in God. I also loved how detailed and smart Michelle made Nicholas along with his physical strength. All together, he was incredibly well-rounded and a nearly perfect hero for our heroine. Overall, I enjoyed the entire read and loved these two on the page together. 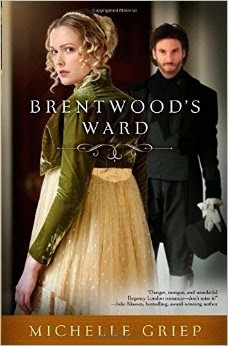 I happily give Brentwood's Ward 4 out of 5 stars and will definitely read Michelle Griep again. Earlier this week somebody else mentioned how great this book is. Thanks for sharing. You're welcome! It was a great read and I'm really looking forward to whatever she puts out next.